Join this small-group walking tour and explore the contrast of the modern and traditional in Tokyo’s urban landscape. Start with a visit to the Meiji Jingu and Senso-ji, the city’s most prominent Shinto and Buddhist sites. Continue with a stroll through the neighborhood of Harajuku, the epicenter of Tokyo’s youth culture. 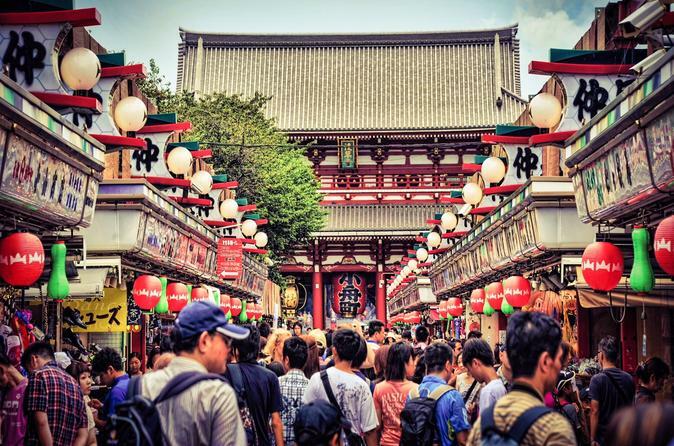 This classic walking tour explores the contrast of the modern and traditional neighborhoods in Tokyo: Meiji Jingu, Senso-ji and Harajuku. We will start the tour with a visit to the Meiji Jingu, the city’s most prominent Shinto site. Meiji Jingu was dedicated to the Emperor Meiji and his consort. Learn about Japan’s ancient religion as you visit the sanctuary, treasure house and other structures built of Japanese cypress with copper plates for the roofs. The next stop is to stroll through the neighborhood of Harajuku, the epicenter of Tokyo’s youth culture. Harajuku is one of Tokyo’s most eclectic shopping districts and home to a distinctive style of urban fashion. If you've ever wondered where those strange outfits featured in music clips and magazines come from, well wonder no more -- it's right here in the subculture world of Harajuku. Continue on visiting Tokyo’s oldest Buddhist temple - Senso-ji. The five-story pagoda, Thunder Gate and distinctive temple architecture are the highlight of this temple. You’ll also have the opportunity to sample lots of Japanese snacks and foods and shop for souvenirs (own expense) on the way up to the temple. Your tour concludes at Sensoji Temple in Asakusa.